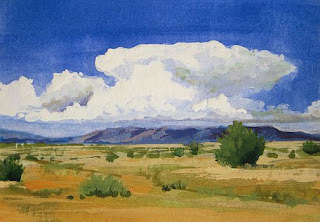 We've had such beautiful anvil clouds forming around here lately that I just had to paint this one. The photograph was taken by my friend Geraldine Garcia, and I stayed fairly true to the cloud but changed the foreground design. I wanted the bushes to form an oval to carry your eye around and back to that spectacular cloud! Hope it worked. Painted in gouache on Bristol vellum, 2.5" x 3.5".